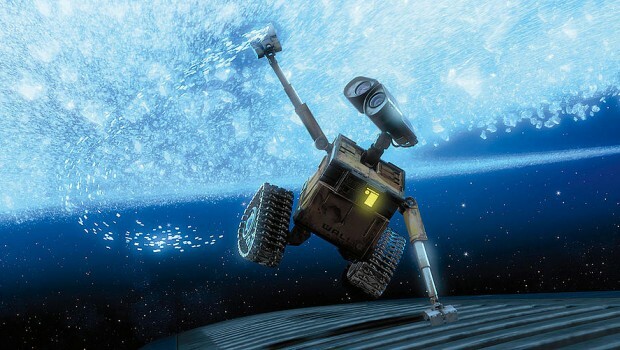 How did you come up with the concept of WALL-E? When Toy Story was in production around 1994, there was a lunch where we were batting around any idea we could think of to try and come up with what the next movie would be. One of the half-brain sentences was, “Hey, we could do a sci-fi movie about the last robot on Earth. Everybody has left the planet but this machine doesn’t know it can stop, so it keeps doing it forever.” That’s where we started. All of the details weren’t there. We had no name for the character, we didn’t even know what it would look like – but it was the loneliest scenario I’d ever heard. I loved it. I think that’s why it’s stayed with me for so long. How did you come up with the design of the robot? Being a sci-fi geek from going to sci-fi movies all my life, I came to my own conclusion that there are really two camps of how robots have been designed. It’s either the tin man, which is a human with metal skin, or it’s the R2D2, which is a machine that has a function and its design is based on that – but you read the character into it. I was very interested in going with the machine side because that was fascinating to me. Were there any other factors pushing towards an R2D2-style robot? Another motivation was the fact that John Lasseter had made Luxo Jr, which was a short animation about a little lamp that hops around. It’s just an appliance – it’s not even made to look like a character. By its own natural design, you can throw a character on to it – and that’s powerful. I’ve had to watch that thing about 1,000 times and I get caught up in it every single time. There is some unique power to bringing that type of machine to life rather than a machine that is designed to look like a specific character. How did you come up with WALL-E’s facial features? I was at a baseball game and someone handed me some binoculars. I hadn’t designed WALL-E yet, but I knew he had to compact trash, so I knew he was going to be a box at the most basic level. I also knew he had to collapse to possibly show that he’s shy – but that’s all I had. I was thinking of putting a single cone lamp on top of the robot because I loved how you read a face into the simplicity of Luxo. I didn’t know if that would hold for 90 minutes though. So the Luxo lamp idea went out of the window when you were handed the binoculars? Exactly. When I got handed the pair of binoculars at a baseball game, I missed the entire inning. I turned the bincoluars around and made shapes with them. I stared at them and made them go happy, sad and then mad. I remember doing that as a kid with my dad’s binoculars but it was all there. There’s no nose and there’s no mouth – and it’s not trying to be a face. It just happens to ask that of me when I look at it. I knew that was it. I knew I couldn’t improve upon that, so I ran with it. That’s why WALL-E has the binocular-style eyes. Can you tell us about the environmental and political message of the movie? I hate to do this, but I wasn’t coming from an environmental viewpoint when I came up with this movie. I knew I was going into this territory, but I don’t have a political bent and I don’t have an ecological message to push. I don’t mind that it supports these views of good citizenship, but everything I wanted to do was based on the love story of the two robots who meet on Earth. That’s the story – plain and simple. I hope you like it.